NO MORE THAN 2' ABOVE WATER LEVEL. BETTER THAN IT PULLS IT FROM THE POND FLOOR TO THE PUMP. before it goes thru the pump. High efficiency, industrial grade pump Ideal for your pond, water feature, or general transfer and recirculation needs. Cascade pumps produce excellent flow rates at sufficient pressure [head] to really get the job done. The industrial grade polypropylene housing is built for long term use. A strainer pot may be attached to facilitate priming and to strain the inflow. Available in 1/8 to 1/4 hp@ 1725 rpm and 1/3 to 2 hp at 3450 rpm. Large Pumps it is better to Wire for 230 so that the pump last longer. Electrical Costs to run the pumps is the same. convenience of self-priming. Molded of corrosion-resistant polypropylene. 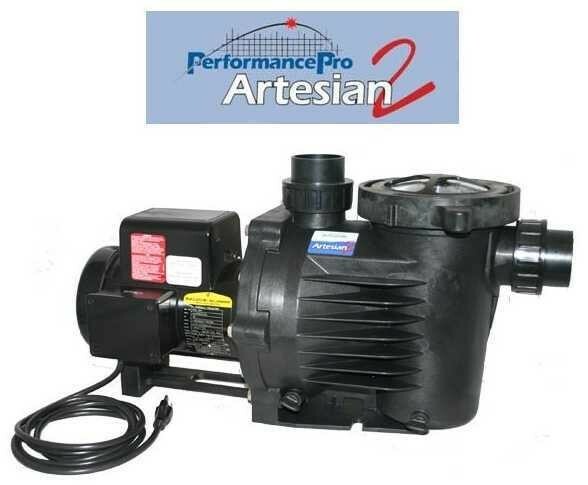 Artesian 2 pumps are ideal for applications in which the pump is positioned above the water level. An easy-open Lexan Lid provides ready access to the integral strainer pot's Large Basket. * Money saving high efficiency pump and motor units. * Wide rnge of performance conditions can be matched. * Self priming design allows for suction lift placement. * Two inch unions and tailpieces are included for easy installation. * Ready for hard wiring or can choose factory attached power cords. *Dual voltage motors are avaible for most sizes. * Both pumps and motor are designed for quiet operation. * Salt water kits avaiable. * Safety first - out of pond pumps help protect both you and your first from annoying and potentially dangerous oi or electrical leaks. 2" Female NPT Suction and Discharge Ports. All 1725 RPM Motors are enclosed for extra protections and long life. Shaft Seals are 316 Stainless Steel. A 16 AWG, 8ft cord with 115 Volts plug is optional. [1725 rpm,1/2HP max.